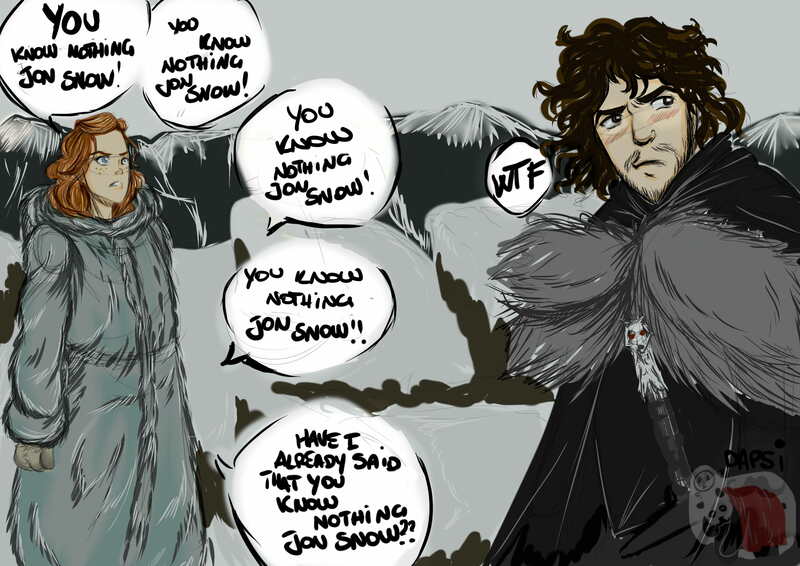 ‘And Ygritte Says’ by Alexeil April (http://alexielapril.deviantart.com/art/and-Ygritte-says-306166334). Used under Creative Commons license. Every day, when I leave my office for lunch, I run a gauntlet of people collecting for charity. For a moment, I contemplated the strangeness of her approach (opening the conversation by asking my name), and then the hunger in my stomach. ‘Sorry,’ I said. ‘I’m in a rush’. As I got away, I wondered why I had said ‘sorry’? After all, what on earth did I have to be sorry about? Maybe I apologised because I’m British and I have had this kind of defensive politeness drilled into me from an early age. After all, I hadn’t given the charity collector what she wanted – and these are just the sort of people to hand out left hooks when they don’t get their own way. But, there’s a simpler, and more fundamental, explanation. In this view, I said ‘sorry’ because I had deliberately ignored my interlocutor’s question. In doing so, I had broken one of the fundamental rules of conversation – that, if someone asks you a question, you respond. And, as it turns out, I wasn’t the only guilty partner: the charity collector had also broken a fundamental rule of conversation by asking my name outright. In the 1970s, the American sociologist Harvey Sacks and two colleagues, Emanuel Schlegloff and Gail Jefferson, began to look at things that might seem taken for granted whenever a conversation happens. They began to delve into the common patterns and features of mundane, everyday conversations. To probe these patterns, Sacks and his co-workers developed a new research method called ‘conversation analysis’, which many linguists and sociologists still use today. Through their work, Sacks and his colleagues were able to ascertain a number of fundamental ‘rules’ of verbal interaction that you won’t see written down anywhere (outside of conversation analysts’ books and journal papers, that is). Nonetheless, these are rules that we all know, and have known, from an early age – even if we don’t know we know them. They are the ‘ground rules’ of speaking, if you like, without which all verbal interaction would rapidly descend into chaos. And they are rules we use every day. Firstly, it’s clear that any give conversation is made up of turns: I speak, then you speak, then I speak, and so on. One of the first rules of conversation is that, any given turn can be made up of a number of smaller components – the building blocks of conversation – which conversation analysts call ‘turn construction units’. These can be anything from a simple ‘eh?’, to words, phrases, and whole sentences – or even multiple sentences strung together. Valid turns include: ‘Hello’, ‘My cat has died’ and ‘Have you seen my book? I’ve been looking for it everywhere’. What don’t count as a turns, however, are incomplete sentences like ‘Have you seen my’ and ‘I’ve been looking for’. The rule is important because, if we have an understanding of what counts as a valid turn, we can anticipate when someone else is going to finish speaking. As a result, to maximise conversational efficiency, we can time our turn to begin almost the instant our interlocutor finishes theirs. Brienne: I think we can treat ourselves to a feather bed for the night [pause] and a hot meal not cooked by you. Podrick: Couldn’t agree more, my lady. Brienne: Don’t start expecting silk underclothes [pause]. You’re not working for your former lord any longer. Podrick: [pause] No, my lady. In particular, notice how Podrick delivers his ‘Yes, my lady’ just as soon as Brienne finishes her sentence. It’s a neat trick, and one that we all carry out, many times each day. Another fundamental rule is that interlocutors’ turns – as in the conversation between Brienne and Podrick – can be arranged naturally into pairs, the third most basic unit of any conversation. Sacks and colleagues identify a variety of different types of such ‘turn pairs’ that occur frequently in conversation. They range from question-answer (‘How are you? Good, thanks!’) to goodbye-goodbye (‘S’ya later! Bye!’). This, for example, is what a greeting-greeting turn pair looks like Game of Thrones style. The importance of this rule is that, whenever anyone gives the first part of an identifiable turn pair (such as a greeting or a question), society expects someone to respond accordingly – and to do so rapidly. For example, have you ever noticed on radio phone-ins how odd it is when the time-pressed host says ‘goodbye’ to an interviewee then cuts them off before they have had chance to respond? It feels unnatural, somehow. The silence of the missing turn is almost audible. As linguists Mark Dingemanse and Nick Enfield have written, ‘so deeply ingrained is our expectation of a rapid reply that any hitch in the flow of conversation is subject to interpretation’ (think of a politician stalling for time when a difficult question comes up). Furthermore, researchers have found that many of these rules are universal to cultures and societies across the world. They are essentially the same whether you are speaking Dutch, English or Japanese – and probably even Dothraki. But the rules of conversation, just like any rules, are made to be broken. Any fan of Game of Thrones will know that the competition for the Iron Throne is as much a battle of tongues as a clash of swords. It’s clear that whoever ends up ruling the Seven Kingdoms of Westeros will have earned their status through some hard fought conversations. And the best players know that, if you want to win the game of tongues, sometimes you’ve got to cheat. Mace: Lord Tywin and I have already determined that I should be the master of ships. Robert: [pause] You’ve got fat. Whenever a second turn in a pair is one which is not expected to follow the first (like when an insult follows a greeting) conversation analysts refer to this ‘dispreference’. Usually, when this happens, the response tends to be marked somehow, often by a pause but also sometimes – like when I refused to tell a complete stranger my name – by an apology: ‘sorry!’. There are other rules too – and many more ways to break them. And conversation analysis is a powerful way to look at how individuals obey and exploit these rules, strategically, in conversation. Dany: I’m not asking you for the Kingdoms. I’m asking you for ships. I need to cross the Narrow Sea. Spice King: Retake? [pause] Did you once sit on the Iron Throne? Dany: Do you know Illyrio Mopatis, Magister of Pentos? Dany may not be successful in this fundraising attempt – but based on this performance, you can’t help but suspect she’ll be successful in the end. So to summarise, if those are the rules, how can you win the Game of Tongues? The answer is simple: Get creative. Break them. This entry was posted in Fantasy, language, linguistics, Literature and tagged conversation analysis, creativity, Fantasy, Game of Thrones, language, linguistics. Bookmark the permalink. This is really interesting… Will have to try breaking the ‘rules’ more. Great ideas/writing. Reblogged this on The Thinking 30-Something. Reblogged this on Wirelezkid's Blog. Hi Lizzy. Game of Thrones is always perfect for examples (especially any scene involving Dany or Tyrion or Small Council members), so it just took a quick browse of YouTube. Reblogged this on Virginia Mateo. Never confuse language with the intention that lies behind. The conversational tools used to engage us as potential consumers are really interesting. There is a cosmetics firm that has a pop up stall in a shopping centre near me. Their opening line is ‘Can I ask you a question?’ They’ve obviously been to the same polite Brit snaring lessons as your charity collector! Turn-taking being universal turns out not to be the case. New Yorkers, Italians, and Ashkenazi Jews are masters and mistresses of what I call the “conversational impasto”, consisting of overlapping contributions, interruptions, interruptions to the interruptions, whole overlapping conversations (often on divergent topics) with or without cross-fertilization between them, and other such apparent violations of Gricean conventions. This can intimidate outsiders or marginal insiders into either silence or (less often) yelling for everyone else to shut up. Very interesting read and it gives me things to think about. I love your writing style. I am a fellow writer as well; feel free to click my username to check it out! This was such an interesting read. I too am a lover of words and language and find this fascinating. As a Brit, I too often find myself apologising for things that I have no business apologising for! Whoa this was even better than the one I just read. I love your blog! I have a problem with my roommate, he lectures and refuses to allow me to speak until he has finished and if I don’t respond to his questions about what he said I get chastised. I am not taking it anymore. Your article is my lifesaver. Thank you. I won’t feel like a peon around him anymore. I’m going to fix it. He is getting the lecture now!